The water is getting colder, but for students from the Blue Ribbon Commission’s Voyage program in Wilmington that didn’t matter too much as they pulled seine nets along the shoreline trying to catch fish and explored a salt marsh while tracking fiddler crabs on a beautiful day in October. These students got to experience firsthand what they’ve been learning about in the classroom from North Carolina Coastal Federation staff members, who in the last few weeks have done a touch tank activity, a lesson on oysters and had students play games that helped them understand stormwater runoff. The students were able to come on the field trip thanks to a $38,141 grant the federation recently received from the State Farm Youth Advisory Board for developing and implementing the “Restoring Coastal Creeks and Habitats” student service learning program in New Hanover County. The grant funded transportation and equipment costs — like boots that students could wear in the marsh — for this field trip, and it will help with similar costs for future field trips. 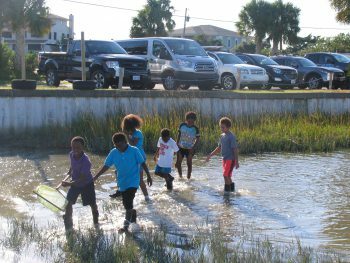 “Without this funding, this wonderful experience would not have been possible,” said Ted Wilgis, coastal education coordinator for the federation’s Wrightsville Beach office. Through the grant, the federation is partnering with the Blue Ribbon Commission (BRC) to provide opportunities for students in the “Youth Enrichment Zone” (YEZ), which is an area with historically high crime rates and gang violence, located in the north side of downtown Wilmington. This particular field trip involved students from BRC’s Voyage program, which is an afterschool program for YEZ students in grades two through six. Wilgis said that few of the students have previously had the chance to explore salt marshes or see firsthand the plants and animals they’ve been learning about. In addition to funding field trips and programs like this one, the State Farm Youth Advisory Board grant will help expand the federation’s partnering with the BRC with their summer programs for rising ninth grade students. Through the grant, the federation will also work with students from New Hanover High School and Ashley High School Marine Science Academy. 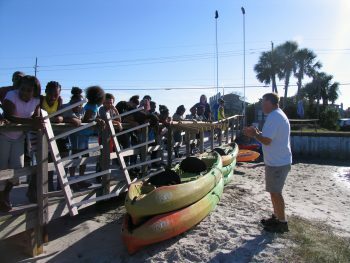 Students enrolled in service learning classes at the high schools will help with restoring and monitoring wetlands and oyster reefs. Participating high school students will also serve as mentors to elementary school students. The State Farm Youth Advisory Board awarded 63 grants this year, and the federation is one of four organizations in North Carolina to receive one. In total, there were 750 applicants. The board is made up of 30 students who select grant recipients and develop a yearly plan to distribute $5 million to programs focused on youth leadership and service learning. For more information on the grant or service learning program, please contact Ted Wilgis at tedw@nccoast.org or 252-393-8185. Read the press release on the State Farm Youth Advisory Board grant. Read about the federation’s classroom activities with students from the Blue Ribbon Commission’s Voyage program.